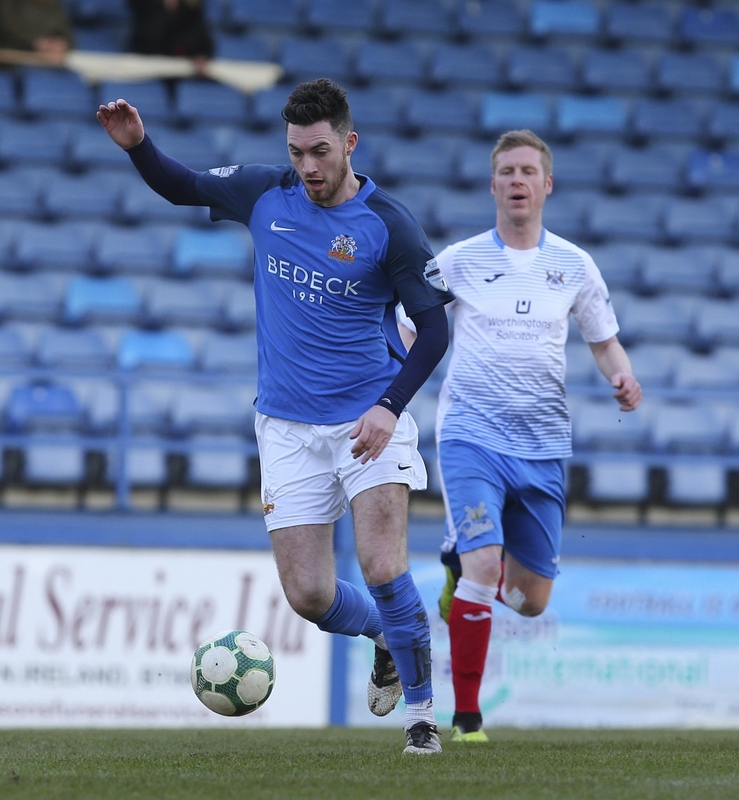 Glenavon picked up their first league win since mid-December as they defeated bottom club Ards 2 – 0 at Mourneview Park on Saturday, moving above Coleraine and back into fourth place in the Premiership standings in the process. 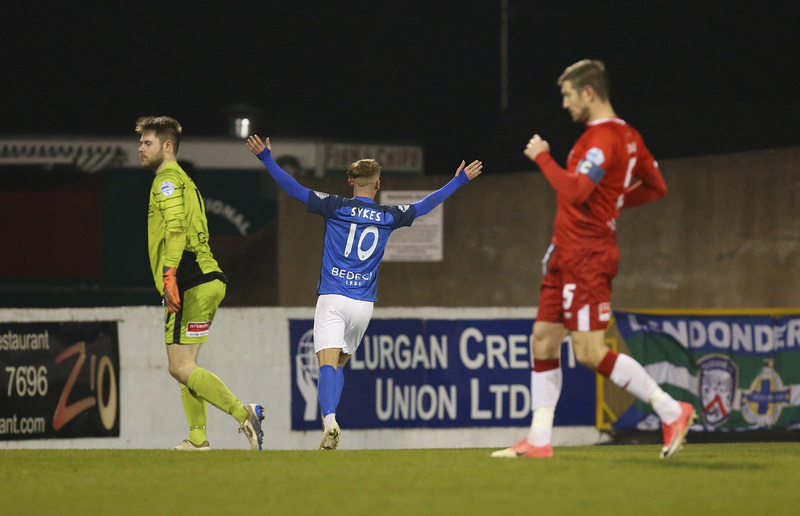 Despite resting a number of key players ahead of Monday night’s Irish Cup tie against Dungannon Swifts, the Lurgan Blues were comfortably on top of an Ards side who carried little threat, and a deserved victory was secured through second-half goals from Cameron Stewart and Conor McCloskey. Stewart grabbed the opener on 62 minutes when he converted a Josh Daniels cross, while eight minutes later the big striker won a penalty when he was upended by Ards goalkeeper Sam Johnston. 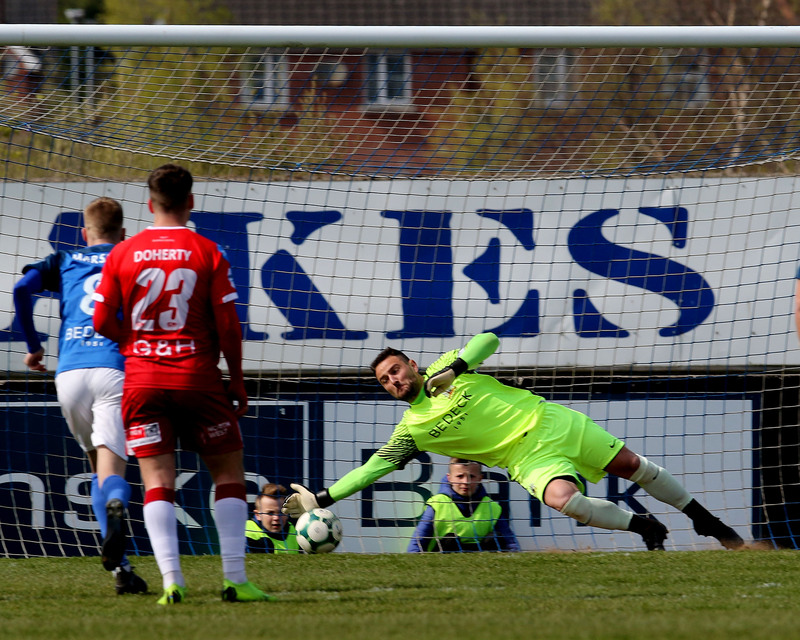 McCloskey stepped up to convert the spot-kick and seal the three points. Daniels was awarded the Glenavon Man of the Match by sponsors Louise McKinstry and Kyle Savage, and the winger set the tone for his performance in the third minute when he carried the ball all the way from his own half into the Ards penalty area. Brendan Bennett got back to make an important recovery tackle to deny Daniels a shooting opportunity. 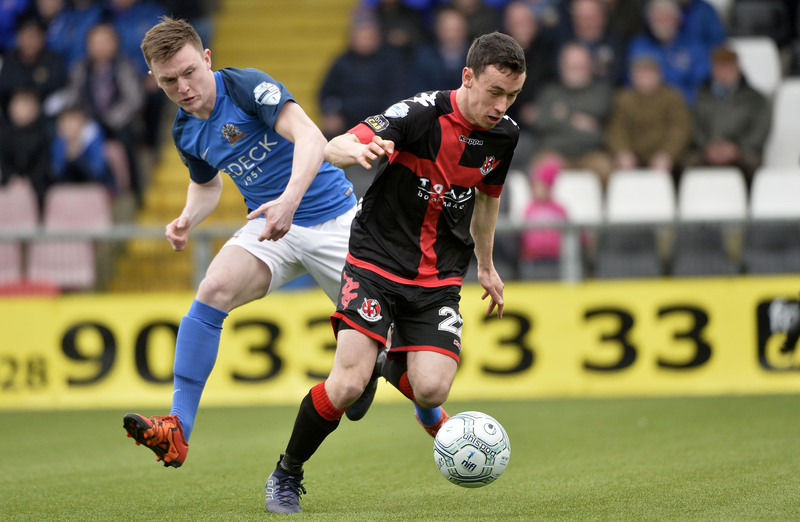 Five minutes later at the other end of the pitch Eoghan McCawl saw his shot blocked by Eoin Wearen, who had an impressive game at the heart of the Glenavon defence. Fifteen minutes in James Singleton rose to meet a McCloskey corner, but he failed to direct his header on target. Ards had appeals for a penalty turned down in the 21st minute when they claimed that Wearen had handled the ball in the box following a Bennett corner, but referee Ian McNabb wasn’t interested. 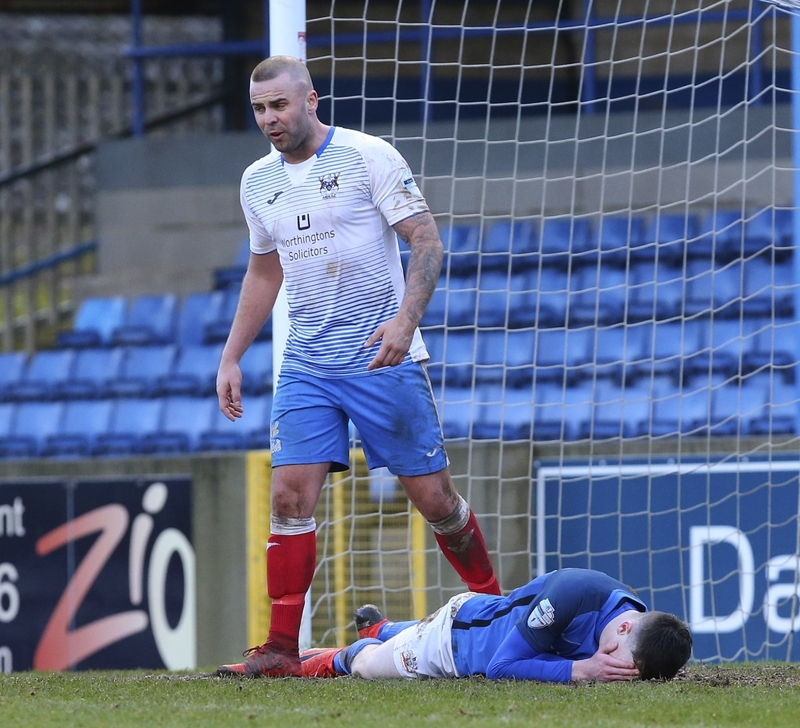 Player-manager Gary Hamilton played the full 90 minutes, and he almost opened the scoring for Glenavon in the 23rd minute when the ball fell to him at the back post following another McCloskey corner, but his volleyed effort went narrowly over the bar. 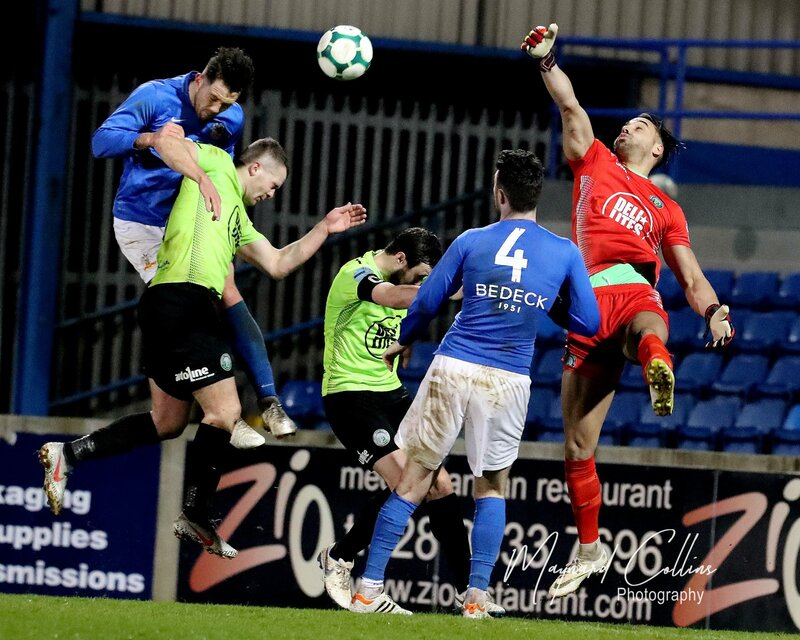 Ards centre-half Damien McNulty got on the end of a Gareth Tommons corner three minutes later, directing a header towards the bottom left corner, but Glenavon goalkeeper Jonathan Tuffey was equal to it, diving down to his right to make the save. On the half-hour mark Hamilton provided a reminder of why he will go down as one of the Irish League’s all-time great players when he produced a sublime bit of skill to set up Daniels, controlling the ball on his chest before hooking it over his head with the outside of his right boot to play it into the path of the winger. Daniels couldn’t keep his shot down, however, and the game remained scoreless. A minute later Stephen Murray chipped a cross in from the right which Daniels would have got on the end of but for a timely interception from Ards captain Callum Byers. Hamilton picked Stewart out with a deep cross from the left in the 36th minute, but the striker’s looping header fell the wrong side of the far post. 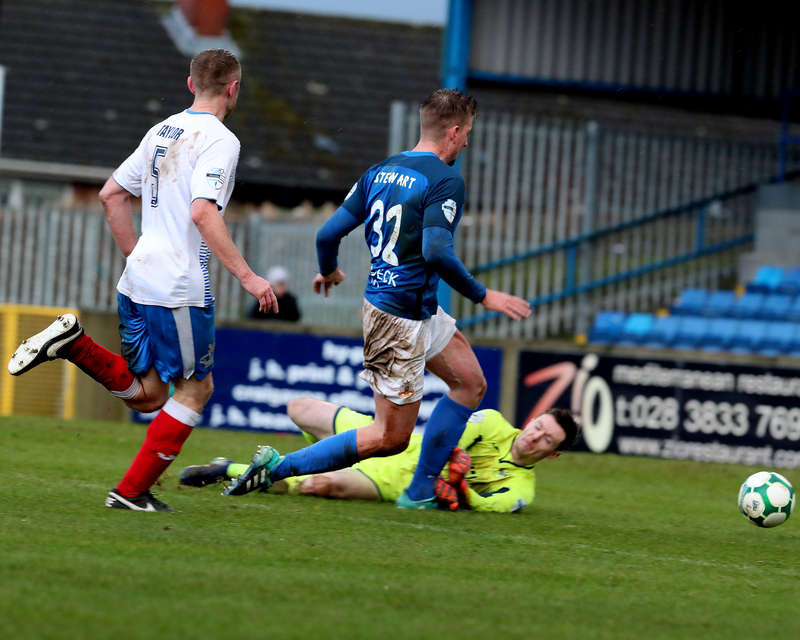 Ards had Byers to thank again on 41 minutes when he blocked a goal-bound volley from Murray after McCloskey’s cross fell to the Glenavon winger, ensuring the match remained goalless at the half-time whistle. 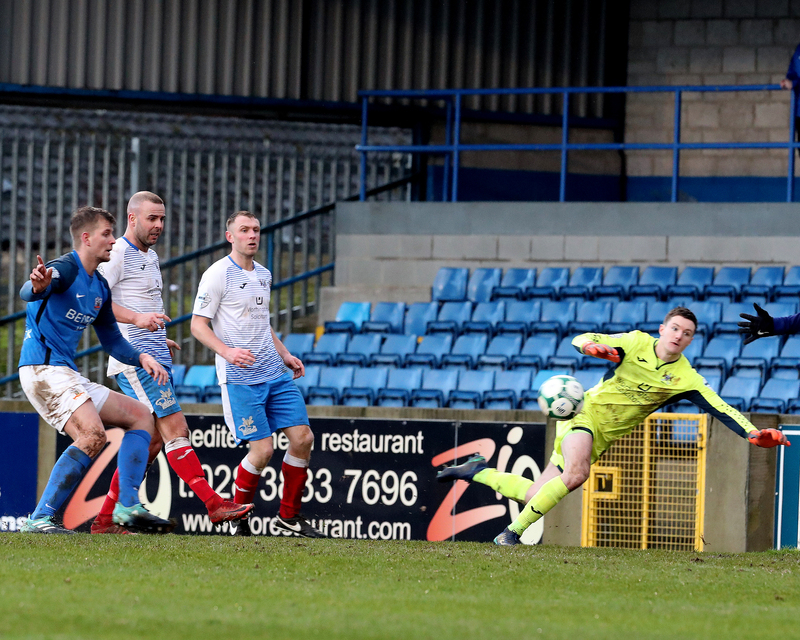 Glenavon looked certain to score five minutes into the second period when Daniels jinked past Byers on the left before playing a low cross into the box which found its way to Murray’s feet. The winger teed up Stewart, but just when it looked like Stewart was going to stroke the ball into the net Kym Nelson threw himself in front of the shot to deny the on-loan striker. 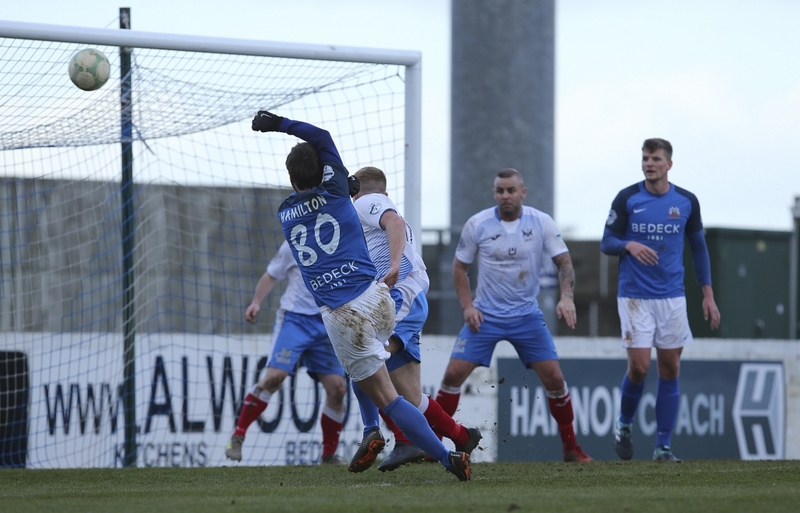 Four minutes later Glenavon did put the ball in the net, but the goal was ruled out after McNabb adjudged Hamilton to have scored with his hand. The Glenavon player-manager received a yellow card for the offence. The first goal did eventually arrive on 62 minutes. Marron’s header into the box found Daniels and he looped the ball across goal with the outside of his right boot. 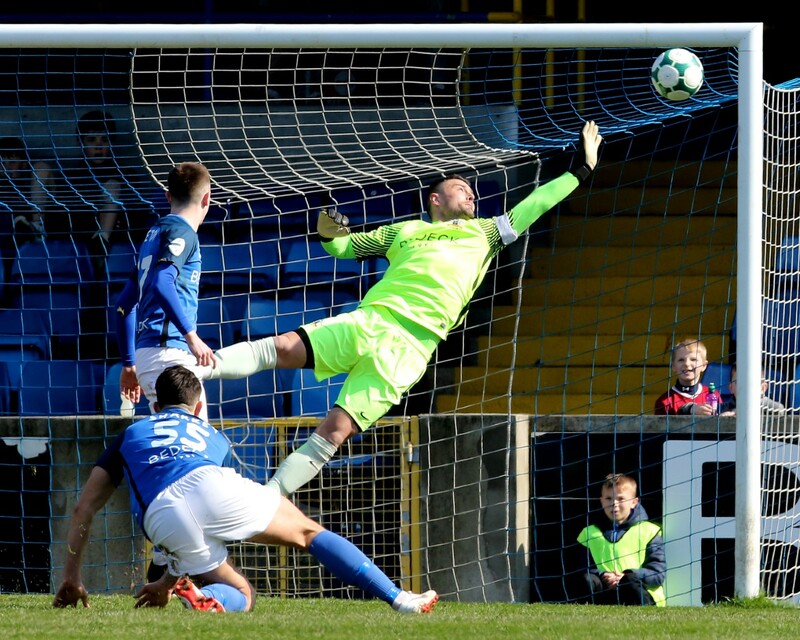 Stewart was there to apply the finish, side-footing the ball in off the far post with his right foot to score his first competitive goal for Glenavon. The home side should have doubled their lead two minutes later when Daniels found Hamilton with a pass from the right. Johnston raced off his line, however, and smothered the striker’s shot. That missed opportunity didn’t prove to be important, though, as the second goal arrived six minutes later. Singleton slipped the ball through for Stewart to run on to. The striker got there just ahead of Johnston, who subsequently brought him down and McNabb pointed to the spot. McCloskey was entrusted with the duty of penalty taker and he made no mistake, sending Johnston the wrong way as he stroked the ball inside the left-hand post. Some of the Glenavon supporters were incensed by an incident involving McNulty and Glenavon substitute Jordan Jenkins in the 81st minute which left the young striker in a heap in the Ards penalty area holding his head, but the match officials didn’t seem to have seen the incident and no cards were brandished, although McNulty was booked just a minute later for scything Jenkins down just outside the box. 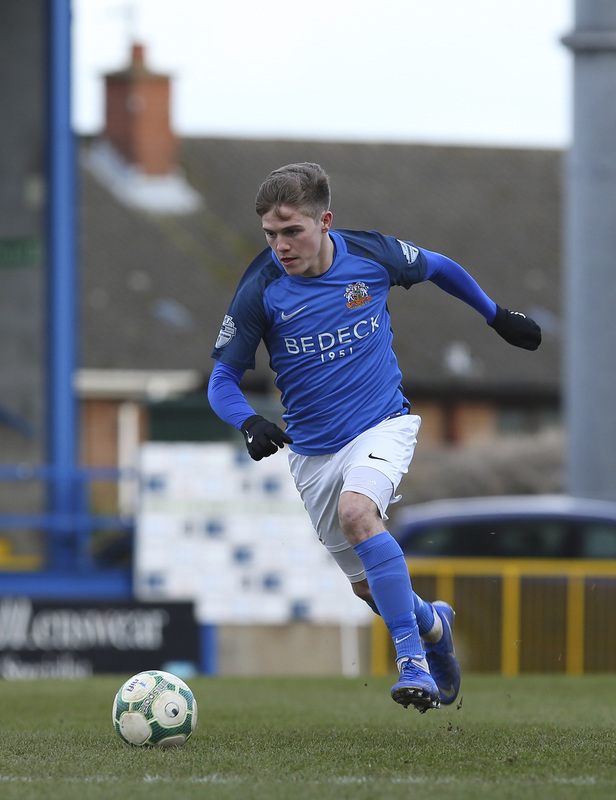 Nelson went close with a curling shot that he struck with the outside of his left foot five minutes from time which drifted narrowly wide of Tuffey’s far post, but the game finished 2 – 0 to Glenavon. Attention turns to the Tennent’s Irish Cup on Monday night (February 11th) as Glenavon play host to Dungannon Swifts for a sixth round tie (kick-off 7.45pm), knowing that victory would set up a home match against either Ballinamallard United or Carrick Rangers in the quarter-finals.